Cliff Holste is Supply Chain Digest's Material Handling Editor. With more than 30 years experience in designing and implementing material handling and order picking systems in distribution, Holste has worked with dozens of large and smaller companies to improve distribution performance. In a crowded and busy DC taking full advantage of all available floor space is a high priority. With the continued proliferation of medium and slower moving SKUs, finding storage and active picking slots for those products is driving shippers to seriously consider any unused space within the facility. For DCs with a clear height of 20 ft. or more, the only space not being fully used is typically overhead. By taking advantage of unused overhead space the company might be able to eliminate the need for a building expansion, and may also benefit from improved order fulfillment productivity, speed and accuracy. The adoption of vertical storage and retrieval technologies that can provide multiple benefits such as building cube optimization, improve inventory storage and accuracy, speed order fulfillment operations, and delay. Fortunately, there are several potentially viable options, one of which would be to install a mezzanine level. While this approach creates additional floor space it also creates a second level of operation and all the construction, system integration, and personnel issues associated with that approach. Another option that is gaining in popularity is the application of Vertical Lift Modules (VLM) and/or Vertical Carousels. Both technologies can provide high density vertical storage in a small footprint and improved inventory control while also supporting a product-to-person order fulfillment strategy. A Vertical Carousel has a series of carriers that rotate vertically in a closed loop. All inventory stored in a Vertical Carousel is moved when parts are retrieved (picked) and replenished. Since the entire inventory moves within a Vertical Carousel, the weight must be carefully distributed to prevent unbalanced loading which could cause overloading of the drive unit. With a VLM, only the require tray is moved to the work/pick station eliminating this issue. Drive components and motor horsepower required for a Vertical Carousel are typically much larger than in a VLM. As inventory moves around the top and bottom of the enclosed loop of a Vertical Carousel, the shelves must rotate to keep level and prevent spillage of inventory. This requires a special cam follower mechanism not required on a VLM. Vertical Carousels have a practical limit on height that is significantly lower that a VLM. Maintenance requirements for Vertical Carousels far exceed those required for VLMs due to the complexity and configuration of mechanical components. Replenishment of the VLM trays can be performed concurrent with picking operations. This practice is not recommended for the Vertical Carousel. 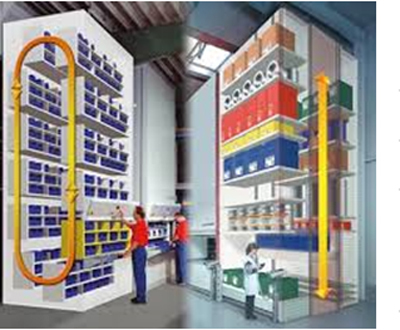 The design of Vertical Carousels make them good choices as efficient, automated, and cost-effective high-density small item storage and retrieval solutions for pharmaceutical and automotive dealership industries for example. However, the design of the VLM can satisfy a broader range of applications for the typical manufacturing and distribution center operation. The adoption of vertical storage and retrieval technologies that can provide multiple benefits such as building cube optimization, improve inventory storage and accuracy, speed order fulfillment operations, and delay or eliminate the need for a building expansion and/or relocation project, are not only immediately beneficial to ongoing operations, but also have long term strategic planning benefits. Most shippers are, or soon will be, providing some level of e-fulfillment services. Adopting equipment and systems now that will also support that initiative is good forward planning. Any reaction to this Expert Insight column? Send below. Join the thousands of supply chain, logistics, technology and marketing professionals who rely on Supply Chain Digest for the best in insight, news, tools, opinion, education and solution.